During the 52nd Paris Air Show, the EACP-ABROAD project organized the first Global AerospaceCluster Manager Meeting. On the 23rd June 2017, 60 international cluster representatives gathered in downtown Paris after a busy week of business meetings to discuss global cluster structures and the idea of building up a global network of aerospace clusters. Industry representatives from 20 countries were present to share their expectations on international collaboration. Participating countries are Belgium, Brazil, Canada, Czech Republic, Denmark, France, Germany, Greece, Ireland, Italy, Japan, Mexico, Netherlands, Portugal, Russia, South Korea, Spain, Turkey, United Kingdom, and United States of America. 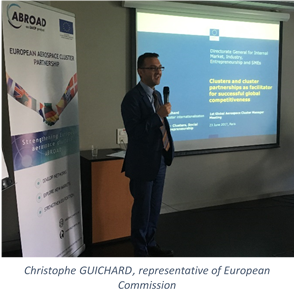 The EACP ABROAD project belongs to the "Clusters Go International" COSME call and is financed by the European Commission DG GROW.